Microplastic is small – the size of a grain of sand or smaller. This emerging pollution is now found all over the world, including the Raritan River. The plastic comes from clothing fibers, packing materials like Styrofoam, and abrasive personal care products like exfoliates. Scientists estimate that total daily microplastic release into aquatic environments may be as high as 8 trillion microplastics a day. Unfortunately, water treatment plants were never designed to address this modern pollution, and so these microscopic plastics are not removed during the water treatment process. Scientists are now seeing microplastics in the tissue of finfish and shellfish, which means microplastics have the potential to enter human food sources. Through the Rutgers Rartitan River Consortium minigrant program, Rutgers School of Environmental and Biological Science professors Dr. Beth Ravit and Dr. Keith Cooper partnered with Sandra Meloa of the NY/NJ Baykeeper to conduct research in the Raritan River focusing on microplastics. 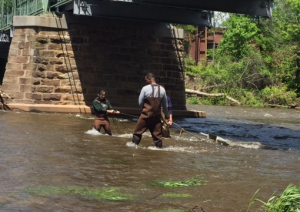 Three Rutgers students were hired to do data collection and analysis to quantify microplastic density and identify the microplastics types that are in the river. They collected five water samples from ten different locations in the river near Johnson Park all the way up to River Road in Branchburg. To maximize the variety of their data, they collected samples under wet (within 24 hours of a 1.25” rainstorm) and dry conditions (more than 48 hours after a rain event). The data collected has provided multiple opportunities for presentation and continued research. The team presented initial results of the data at the Hudson-Delaware Chapter of the Society of Environmental Toxicology and Chemistry in early October. Dr. Cooper’s graduate student is using the samples to determine whether toxicological affects may be associated with the presence of plastic by exposing larval fish to it. The team is collaborating with Rutgers Environmental & Occupational Health Sciences Institute (EOHSI) labs to identify persistent organic contaminants sorbed to microplastics in New Jersey surface waters, and the NOAA James J. Howard Marine laboratories are using the data to identify plasticizer components of the various types of particles. These analytic results are expected to be available by the end of this year. A paper describing these research approaches is now in review at AIMS Environmental Sciences.